The recent pleasant weather would indicate that spring is finally here although not quite barbeque weather the summer birds are definitely returning. We have seen Ring Billed Gulls, Red Tailed Hawks, Juncos and Pine Siskins. Now, I am waiting for the robins and swallows. This week I want to take a brief look at bird houses for Tree Swallows. The dimensions and materials used are the same as for wrens except the hole has to be 1.5 inches (32 cm) in diameter. This allows the swallows to enter and exit with ease. Unfortunately it also allows early nesting House Sparrows to utilize the house usually pre-empting the Tree Swallows. One way to discourage House Sparrows is to hang the bird house instead of attaching it with screws or nails to a tree, pole or building. In my experience only Tree Swallows will readily nest in a “swinging” bird house. To dampen the amount of swing on windy days I attach a suspended weight to the bottom of the bird house. I did just that last year only to have a wren nest in it and rear a brood. The Tree Swallows chose another house that was in our yard. Very unpredictable but there is nothing wrong with that. 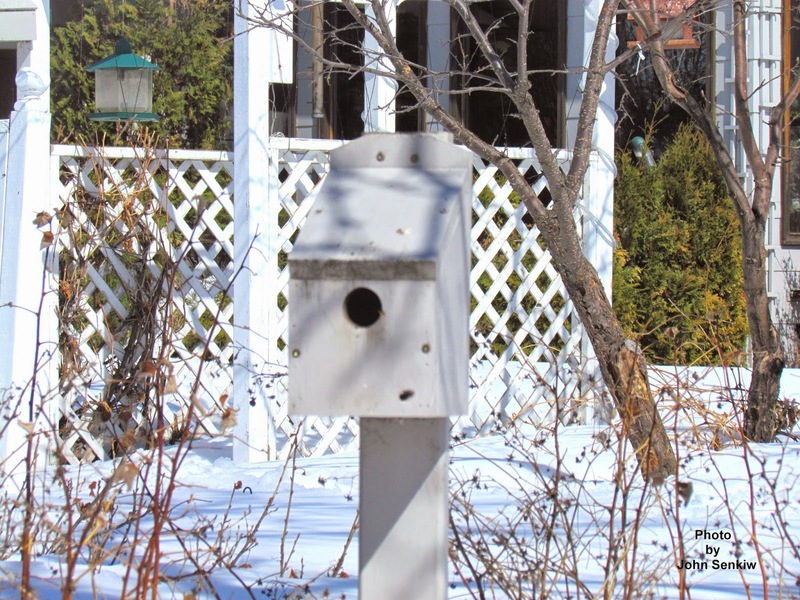 Unlike wrens Tree Swallows will occupy birdhouses that are set out in open spaces such as pastures and crop lands. This also discourages House Sparrows as they do not like to be far away from trees and buildings. As a bonus this placement also attracts Blue Birds. The disadvantage is that the birds cannot be observed simply by looking out of a house window. Steel (tin) cans cannot be used here as they will overheat and kill the young. 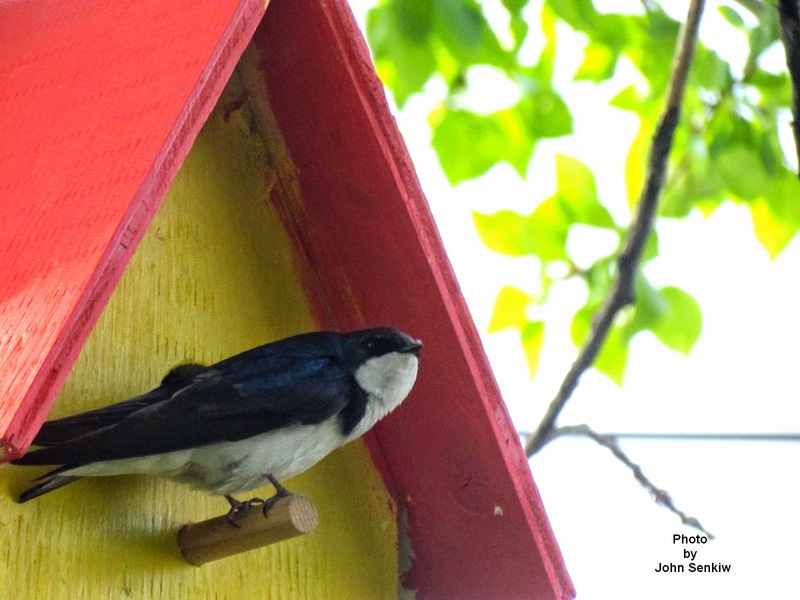 This week’s photos show two of our bird houses made specifically for Tree Swallows. The lean-to is one that I built and painted by myself. If I do say so myself it is a very attractive and functional bird house but no bird has built a nest in it since I put it up six years ago. Meanwhile, the bird house that our granddaughter built as a school project last year was occupied with Tree Swallows within a week after it was put out. Go figure! The photo includes a picture of the aforementioned Tree Swallow sitting on a peg just below the entrance. As mentioned above the hanging house that I put out for the tree Swallows was occupied by a House Wren. Again, go figure.